16 ounce Kosher Baby Dills are a small whole dill pickle. Made through the fresh pack process, these dills are also Certified Kosher. From Guenther Fanter of Westlake, Ohio on 1/29/2018 . Please don't bother eating any other pickles. These are the "BEST". From zero to five, this is a FIVE PICKLE REVIEW ! From George Makrauer of The Villages, Florida on 12/9/2016 . My wife has been buying Sechler's Kosher Baby Dill Pickles from a local store, one or two jars at a time... and I ignored them as they, in my eye, just took up shelf space in our refridge. THEN, one day my curiosity moved my hand to move the jar out to the kitchen counter. "I want to try one of these pickles you keep buying." "You can have ONE. Don't eat all my pickles." Eating just one took me back to my young days in SE Florida and our family's frequent visits to Wolfie's, the Rascal House and Pumpernick's. Great memories and fresh saliva flowed together. These Kosher Baby Dills are very close to the flavor and texture I remember and have missed for decades. So, we bought a carton of four jars... and am ready to order a refill... probably need to order six, since THESE pickles make a great meal starter, a late morning to late evening snack, and chopped up as elements of salads of all kinds. Salivating again... gotta go get my fix. From Anonymous of Memphis, Tennessee on 8/5/2016 . This is the best pickle I've ever had. So light and delicate of flavor. And I've tried plenty in Lübbenau, believe me. Thank you, Sechler! From Anonymous of Auburn, Indiana on 5/5/2015 . This is a great pickle. It is the best one on the market. Far superior to Clausen,Vlasic and any other major brand. This quality pickle is a must if you like pickles. From Susan Riedesel of Ripley, New York on 9/15/2014 . 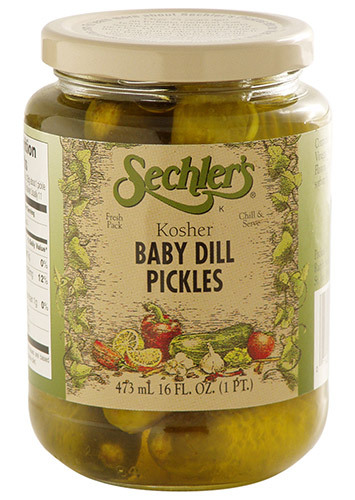 Sechler's Kosher Baby Dills are the best tasting pickles that we have ever found. They were introduced to us on a trip to visit our daughter and grandchildren in Leo, Indiana. She took us to the tour offered by Sechler and my husband has been hooked on these pickles since that time. If we can't make a trip to Indiana we order them on line. Can't be without a jar of these in the refrigerator at all times!